Olive Dragonfly: New adventures with Uckfield FM! 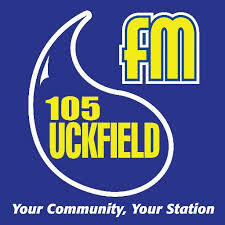 I am delighted to announce that I have joined the team at Uckfield FM! I will be doing a new monthly chat slot with Jacqui Rushton (who interviewed me last month about the blog). I was first approached by Mike Skinner about being a contributor back in August after he saw my Thai Terre review and I was asked then to do a chat slot talking about what I get up to locally but had to turn it down. Although I was nervous about speaking live on air, after seeing how easy it was to chat with Jacqui, and how much fun, when they asked me again in October, I decided to go for it! Unfortunately it has meant I can no longer continue with my columns at Uckfield News, a decision I understand but nevertheless is a shame as I really enjoyed writing for Cathy and sharing our family adventures. I was delighted in July when Cathy took me up on my offer to write a family based column on local events and places and will always be grateful for the opportunity and encouragement she gave me in writing for a news publication. As I am no longer a columnist at Uckfield News, Uckfield FM have asked me to continue writing a similar feature for their website which will tie in nicely with my on air chat slots so you can still catch my summaries and of course, follow along on the blog for full reviews and more photos as well as everything else I share here. It's an exciting time with another fantastic opportunity for me and Olive Dragonfly blog! Thanks to Mike, Gary and Jacqui for asking and welcoming me to the team :) I'm so looking forward to working with you all!